Size: To vary the sizing, you can change the needle size to produce a different gauge. 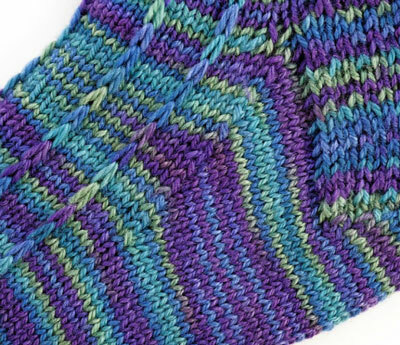 A tighter gauge will produce a smaller sock, and a looser gauge will produce a larger sock. Length is adjustable. Rounds 1 and 2: * K5, sl 1 pwise wyib *, rep from * to * around. Rep rounds 1–3 for patt. Because these are top-down socks, you begin with the cuff and leg. CO 48 (60, 72) sts. Divide evenly over four dpns and join for working in the round, pm to indicate beg of the round. Work 1 x 1 twisted rib for 1 inch or desired length. Switch to slip-st ridges patt and work even until piece measures 5.5 (6.5, 7.5) inches from beg, ending with Round 1. End last round 12 (15, 18) sts before beg of the round. Work the heel over 24 (30, 36) sts. Row 1: * Sl 1 pwise wyib, k1 *, rep from * to * for 24 (30, 36) sts. 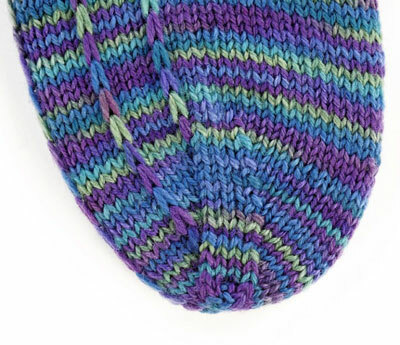 Row 2: Sl 1, purl across heel sts. Row 3: Sl 1, *sl 1, k1 *, rep from * to * to last st, k1. Row 4: Sl 1, purl across heel sts. Rep rows 1–4 until heel flap is 24 (32, 36) rows long. Row 1 (RS): K 14 (17, 20) sts, ssk, k1, turn. 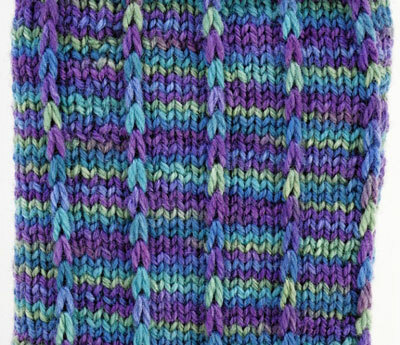 Row 3: Sl 1, knit to 1 st before gap, ssk, k1, turn. Row 4: Sl 1, p to 1 st before gap, p1, turn. Repeat rows 3 and 4 until you have worked all heel sts, ending with a WS row. 14 (18, 20) sts rem. Next round: Knit 14 (18, 20) sts. With the same needle, pick up 13 (17, 19) sts along side of heel flap. Work in patt across 24 (30, 36) instep sts. With an empty needle, pick up 13 (17, 19) sts along second side of heel flap. 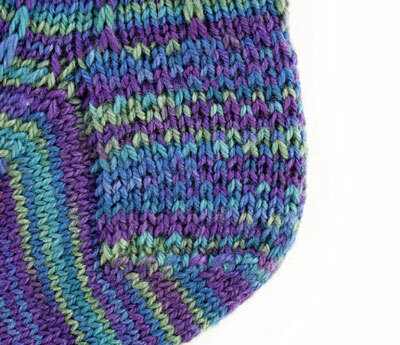 With the same needle, knit 7 (9, 10) heel sts. Round now begins at center back heel. Needle 1: K to last 3 sts on needle, k2tog, k1. Needles 2 and 3: Work instep sts in Slip-St Ridges patt. Needle 4: K1, ssk, k to end of round. Repeat rounds 1 and 2 until 48 (60, 72) sts rem. Work in patt, maintaining Slip-St Ridges patt over instep and St st on sole, until work measures about 5.5 (7.5, 8.5) inches from back of heel. Needle 2: K1, ssk, work in patt to end. Needle 3: Work in patt to last 3 sts, k2tog, k1. Needles 2 and 3: Work in patt. Repeat rounds 1 and 2 until 24 (32, 36) sts rem. Repeat Round 1 only until 12 (12, 16) sts rem. Knit 3 (3, 4) sts. Cut yarn, leaving a 12-inch tail. Graft toe with Kitchener st.